The dreaded finals season has returned to Douglas College. Information will be crammed, textbooks will be skimmed, and celebratory beverages will, eventually, be consumed, and while Douglas College may not be able to help you with that last one (at least not as far as alcohol is concerned), they are most certainly stepping up for the first two. 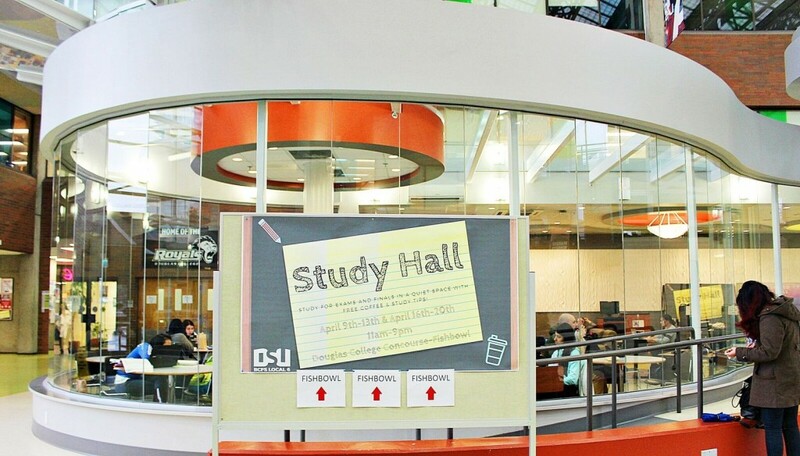 Study Hall has opened up at Douglas College’s New Westminster Campus, allowing students an ideal place to cram for those finals alongside other students who are as equally, if not more so, totally freaked out. To keep the cranial juices flowing—and to stop people from accidentally napping in their textbooks—the college is offering free coffee throughout the week within the glass fishbowl area, along with study tips to help out any struggling students. The Study Hall will run from 11 a.m. to 9 p.m. April 9 to 13 and again April 16 to 20. Tristiana Allwood, a first-year Douglas College student, had not been planning to attend the Study Hall, though said it was more to do with the fact that she didn’t know it was occurring, rather than lacking a need to study. “I didn’t know about it,” she said when asked. Instead, Allwood has made plans to study for finals with a group of friends that she met in class, who had been put together for a class project, but then decided to stick together throughout the rest of the year. Allwood said that the group is definitely a help when it comes to studying, as the set plans keep her from procrastinating. However, she also stated that, on occasion, it can be something of a distraction to study alongside friends. “Sometimes it can be distracting, depending on the day or what we’re actually doing, but sometime it’s just nice to get out of the house, come and study, and bounce ideas off of each other,” she said. While Allwood may not be attending the Study Hall at Douglas College, other students are encouraged to use the area to ready themselves for finals, as it may even offer the same draw that Allwood finds with her study group: A reason to get out of the house.